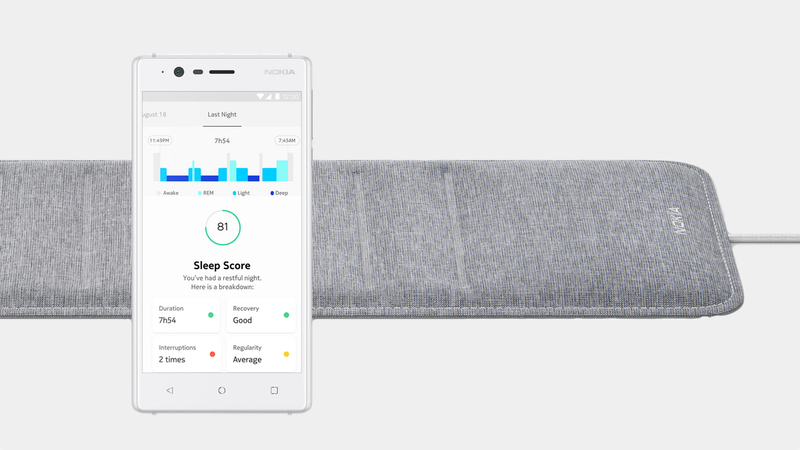 While there may still be some uncertainty surrounding the future of Nokia Health, the Finnish company it's still rolling out new devices with the Nokia Sleep pad now available to buy. Announced back in January, the Nokia Sleep takes the place of the dearly departed Withings Aura. Actually, the Sleep is largely similar in looks to the Aura save for one noticeable difference: The Sleep ditches the big light pod and alarm speaker that took up a lot of space on your night stand. According to Varoun Sanath, the product manager lead on Sleep, the pod wasn't actually all that popular with owners of Aura's sleep setup. Sanath also told us that the pad will still work with the bed light/speaker if you don't want to let it go. If you want to swap pads, it's best to plug the USB cable from the new Nokia Sleep into the USB port situated furthest on the right at the back of the speaker. The Sleep is simply a Wi-Fi enabled pad that slips entirely under your mattress and keeps track of your sleep. What it lacks in hardware it makes up in software and services. You'll certainly get your sleep cycle analysis, with the Sleep keeping track of sleep duration, interruptions, light, deep and REM phases and snoring tracking. Every morning you'll get a Sleep Score in the companion Nokia Health Mate app that tells you how much restoration your sleep provided you. You'll even get recommendations on what you can do to get a better night of sleep. That's not all though, Nokia has teamed up with sleep experts to develop the Sleep Smarter Program. You'll be guided through an eight-week program in the Health Mate app that'll help you understand your sleep patterns and learn how to have more balanced and regular sleep schedules - this includes navigating the difference between weekday sleep schedules and weekend sleep schedules. Nokia says the program can help you get up to 12 minutes more sleep a night with tiny changes. Finally, the Nokia Sleep integrates with IFTTT. So now you can include it in your smart home recipes so that when you get in bed your temperature will lower and when you get out of bed your smart blinds can let some sun in. The Nokia Sleep is available now for $99.95. You can purchase it on either Nokia's website or through Amazon.